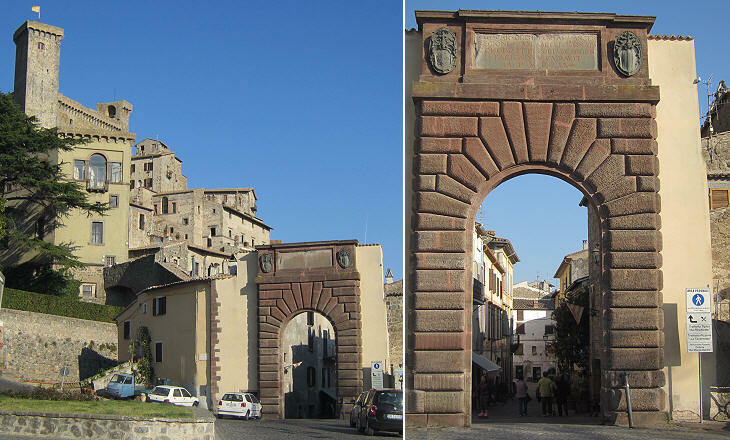 Bolsena is Volsinii, an ancient Roman town built near the site of Etruscan Veltzna, which was conquered by the Romans in 265 BC. The centre of the Roman town was located in the northern part of the current settlement. Archaeologists have identified the sites of baths, temples, a small theatre and an amphitheatre. The town gave its name to the volcanic lake near which it was located. In 1991 a small archaeological museum was opened in the castle (Rocca Monaldeschi della Cervara) to house findings at Bolsena and its environs. Bolsena is crossed by Via Cassia, the ancient Roman road which during the Middle Ages became known as Via Francigena, because it was utilized by pilgrims from France to reach Rome. 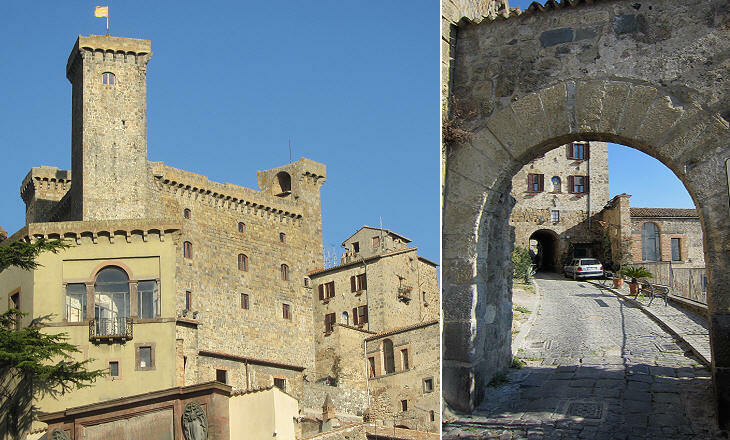 Today travellers arriving at Bolsena from the north have a nice first impression of the town. Not so Charles Dickens who in January 1845 spent a night at Bolsena: We came, at dusk, within sight of the Lake of Bolsena, on whose bank there is a little town by the same name, much celebrated for malaria. With the exception of this poor place, there is not a cottage on the banks of the lake, or near it (for nobody dare sleep there); not a boat upon its waters; not a stick or stake to break the dismal monotony of seven-and-twenty watery miles. We were late in getting in, the roads being very bad from heavy rains; and after dark, the dullness of the scene was quite intolerable. The castle was built between the XIIth and the XIVth centuries by the Monaldeschi, who were the de-facto rulers of Orvieto and Bolsena. 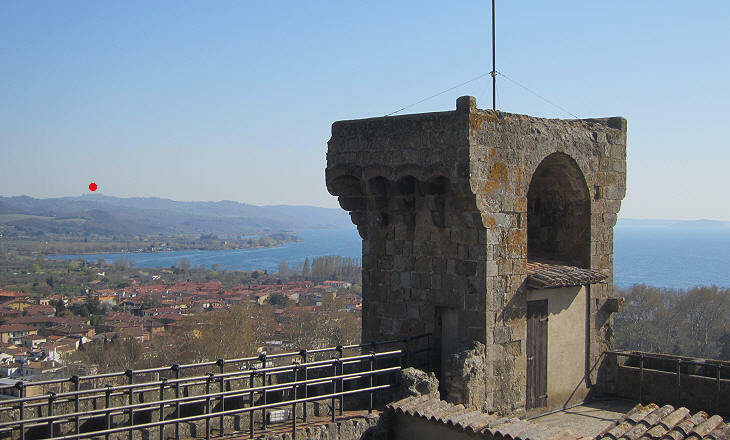 During the XVIth century the Farnese Dukes of Castro tried to annex Bolsena, but their attempt failed. Bolsena's eels and the Vernaccia wine. The pope portrayed by Dante fasting in Purgatory because of his gluttony is Pope Martin IV, who was elected in 1281 after a very turbulent conclave in Viterbo and forced to leave the town because of continuous unrest. He was unable to reach Rome, as the Romans had supported another candidate and he spent most of his pontificate at Montefiascone and Orvieto, two towns known for their wines where, according to Dante, he banqueted too much. During the Middle Ages Lake Bolsena was known as Lago di S. Cristina, due to the fact that St. Christina of Bolsena, a IIIrd century young martyr, was thrown into the lake tied to a slab of stone, because she refused to abandon her Christian beliefs. The stone however, instead of dragging her down, supported her and carried her to shore. A stone with the imprint of the saint's feet is venerated in a IXth century altar inside a cave, which was eventually turned into a shrine. 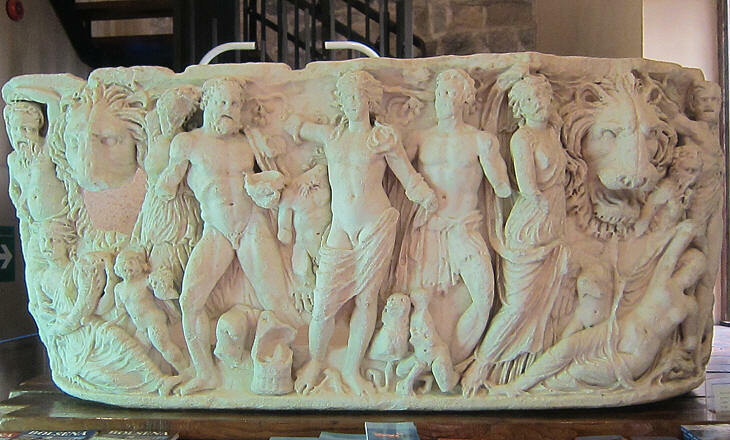 The ancient Romans used to celebrate the safe return from a journey by dedicating similar stones to Rediculus, the god who protected travellers (see an example found at Dion). The Miracle of Bolsena occurred in 1263 at the shrine near the cave. A Bohemian priest, who was somewhat sceptical as to the doctrine of transubstantiation, was convinced of its truth by the miraculous appearance of drops of blood on the host he had just consecrated. The miraculous event was reported to Pope Urban IV who instituted the feast of Corpus Christi in the following year and planned the erection of the Cathedral of Orvieto, the town where he resided. 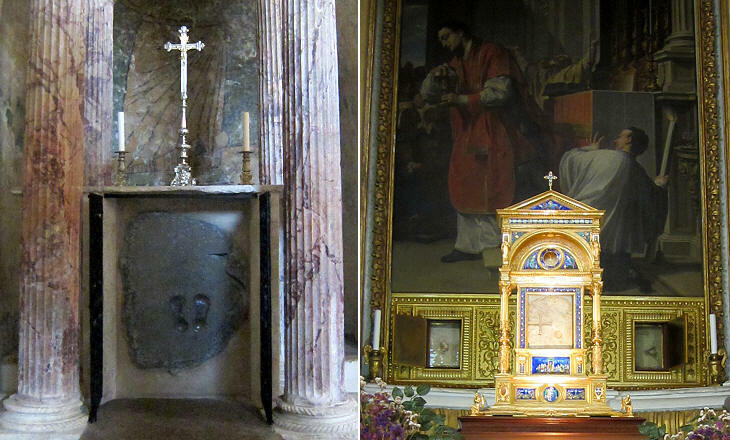 Small stones with blood blots are kept in a precious reliquary in a chapel built in 1693 to celebrate the miracle. 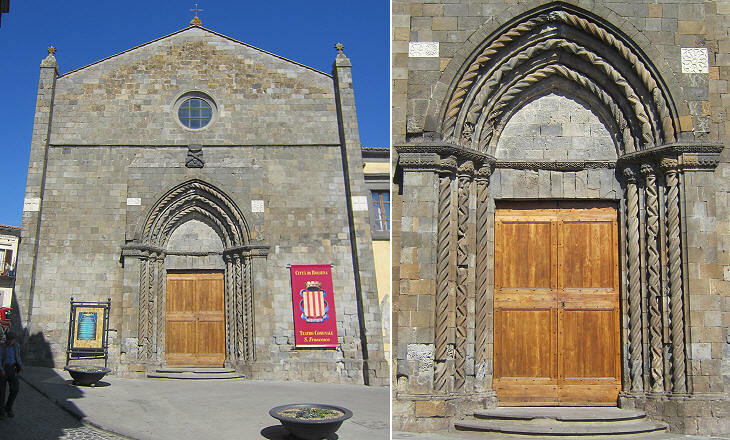 The two miracles were celebrated in Bolsena by the erection of a series of buildings over a period which spans eight centuries as Collegiata di S. Cristina was consecrated in 1077 and the façade of Cappella del Miracolo was completed in 1863. yet the complex, notwithstanding the difference in style of its components, does not lack harmony. 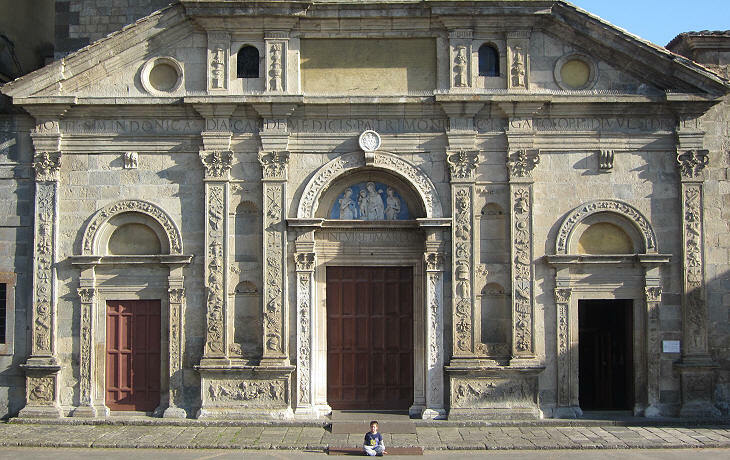 Collegiata di S. Cristina has an elegant façade built in 1492-94 at the expense of Cardinal Giovanni de' Medici (who in 1513 became Pope Leo X) when he was legate of Patrimonium Petri, the region around Viterbo. Its neat design is probably a work by Francesco and Benedetto Buglioni, two Florentine ceramicists. The reliefs which decorate the pillars were inspired by paintings discovered in those years at Domus Aurea in Rome (see Abbazia di Grottaferrata for another example of this decoration). The image used as a background for this page shows a detail of these reliefs. The influence of the Florentine Renaissance shows up in the glazed terracottas on the portals of Collegiata di S. Cristina and Oratorio di S. Leonardo. St. Christina was portrayed carrying the stone of his martyrdom, although the stone actually saved her. St. Leonard of Noblac was the patron saint of prisoners and this explains why he was portrayed carrying handcuffs. He became particularly popular among the captives in Muslim hands after Bohemond I of Antioch claimed to have been released from a Danishmend prison after he prayed to St. Leonard. 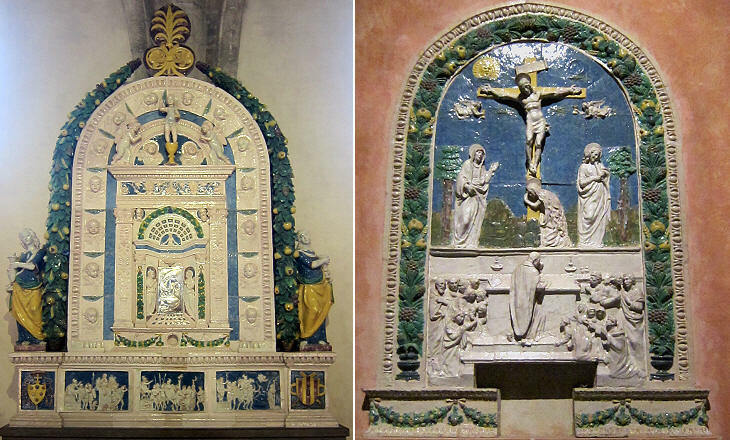 The Buglioni were rivals of the better known Della Robbia. Cardinal Giovanni de' Medici did not hesitate to commission glazed terracottas to both workshops. 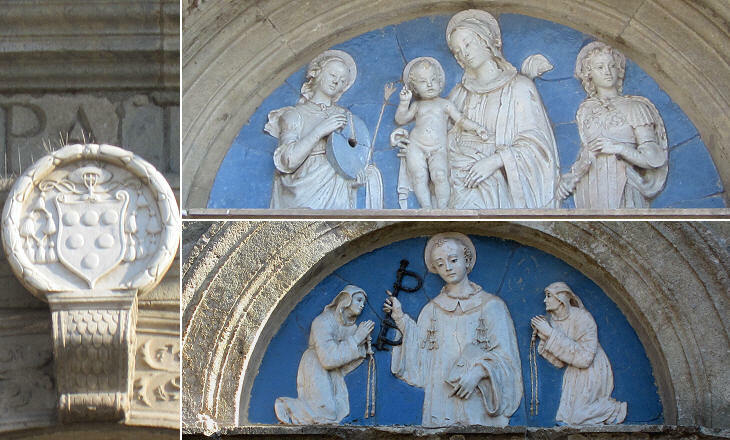 Other works by the Della Robbia can be seen at S. Maria della Querce, near Viterbo. The use of glazed terracottas for reliefs and for small sculptures became very popular in the second half of the XVth century, but after the deaths of the last members of the Della Robbia and Buglioni families it almost disappeared. 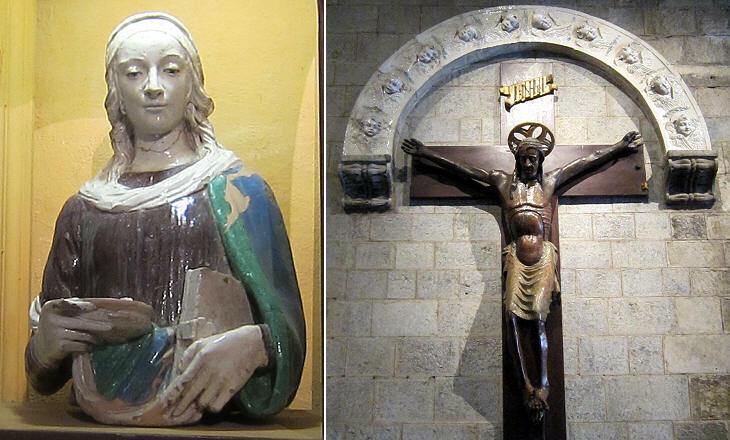 The many glazed terracottas at the religious complex of S. Cristina are a summary of this type of works of art. 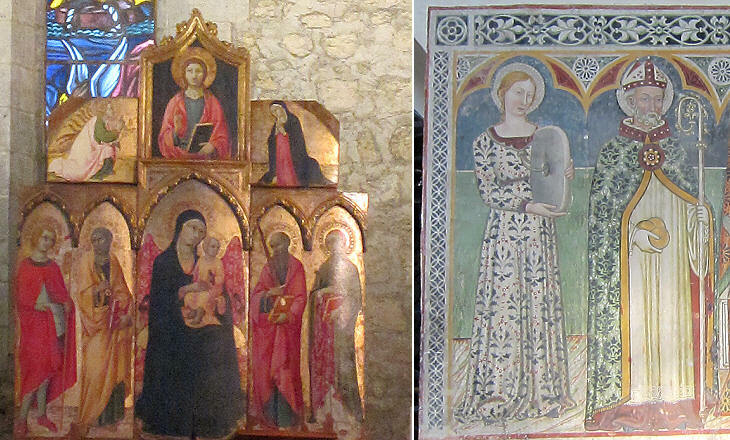 In many Italian churches changes in taste led to replacing paintings which were thought to be naive with new ones. At Collegiata di S. Cristina luckily this did not occur because during the XVIIth and XVIIIth centuries religious authorities focused on building Cappella del Miracolo which was decorated with stuccoes and altarpieces in line with the fashion of the time. Cardinal Giovanni de' Medici built a fountain in the centre of the old town which underwent significant changes in the following centuries, but retains an elegant relief portraying three swans. Doves drinking from a cup were often portrayed in ancient mosaics showing the Three Graces (see an example at Narlikuyu in Turkey); they then became a Christian symbol for achieving Divine Grace (see a mosaic at S. Costanza in Rome). 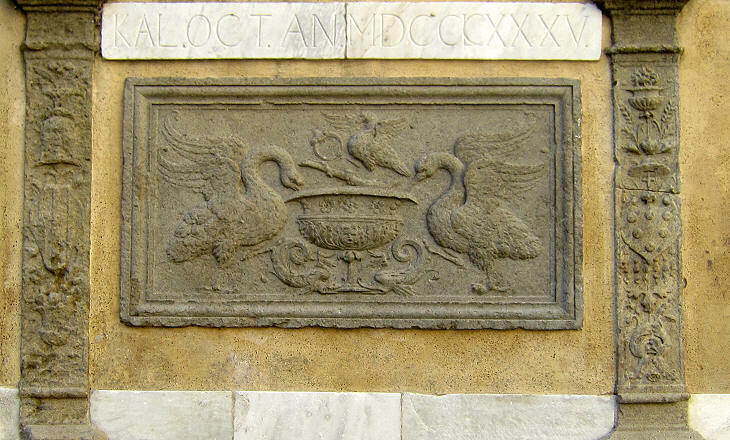 In this relief Cardinal de' Medici had them replaced by swans, a symbol of good fortune according to Virgil, as reported by Cesare Ripa, the author of a book on iconography. WWII bombings damaged this church, but they revealed its original structure beneath later modifications. 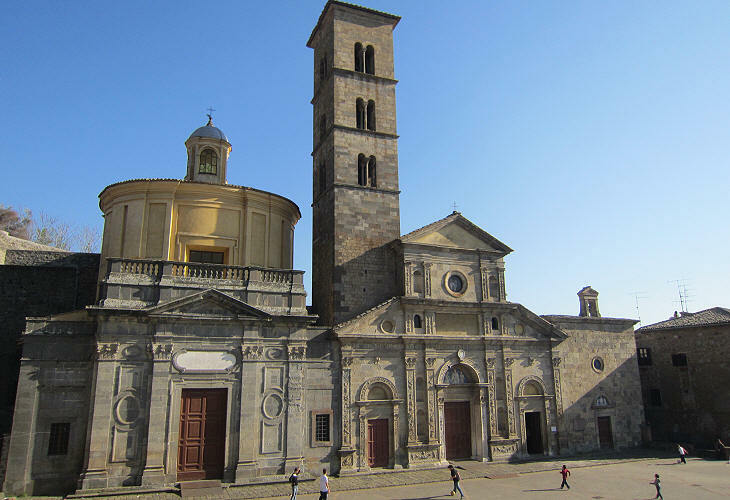 It is the main church in the oldest part of Bolsena.